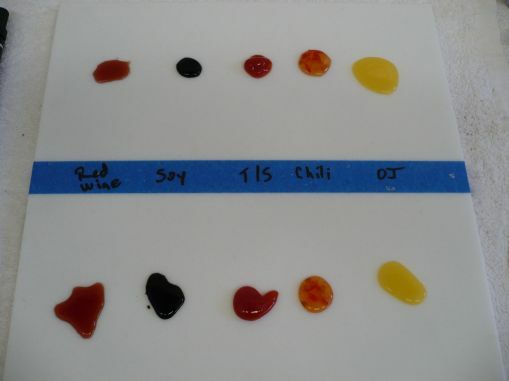 Depending on the source of the staining (and often the location of the surface) staining can either occur in isolated spots, or can be consistent across the surface. So many things around a home can cause stains – isolated stains generally occur from spills of oils, food, drinks, glue or cleaning chemicals. Depending on the contaminant (what caused the stain), the porosity of the tiles (how deep the stain it has gone) and the age (how long it’s had to ‘cure’) will determine whether you stand a chance of removing the stain yourself, or whether you’ll need an expert to fix your stained tiles. Is it possible to restore stained tiles? Yes – a Deep Dirt Extraction can remove stains by drawing the contamination out of the surface. For isolated or particularly bad stains, a Blemish Removal treatment targets problem areas. Can future staining be prevented? Porous tiles should always be protected by a high-grade sealer designed for your stone or tile, and the environment in which it is installed. A Slique Stain-Guarding treatment applies the most appropriate sealer to a surface to help prevent future staining. Sealing will not totally prevent stains – it will keep the stain on the surface, giving you time to clean it off before it penetrates. It’s important to act quickly to clean up any spills. 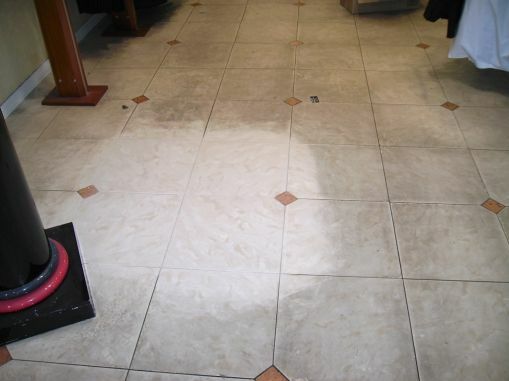 If you have stained tiles, you can book a free Slique Consultation – we’ll come and confirm your problem, and give you a quote for our Technicians to professionally restore the surface to as-new condition. 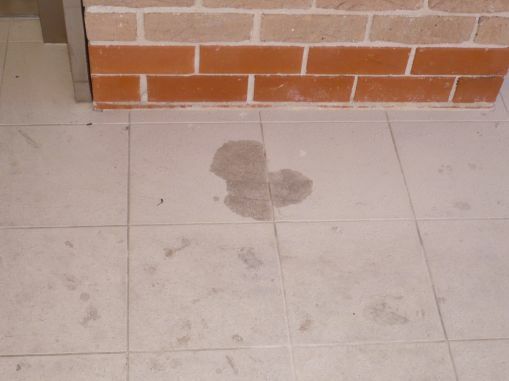 Widespread staining is most commonly caused by incorrect cleaning methods. This floor has been partially restored.